Are Maltodextrin and Dextrin Gluten-Free? Maltodextrin, a common food additive, is a type of sugar that’s made by breaking down starch. Once manufactured, maltodextrin is a fine white powder, which can be either neutral in taste or slightly sweet-tasting. Because of its sweetness and consistency, it is used in a variety of processed food products including sodas and candies. Dextrin, on the other hand, is a stickier, gummy ingredient, made by heating starch, that is often used to bind things together. Different types of dextrins, made from different starting materials, can be used as ingredients in food coatings such as in frozen fried chicken, binders for pharmaceutical products, and even envelope glues. 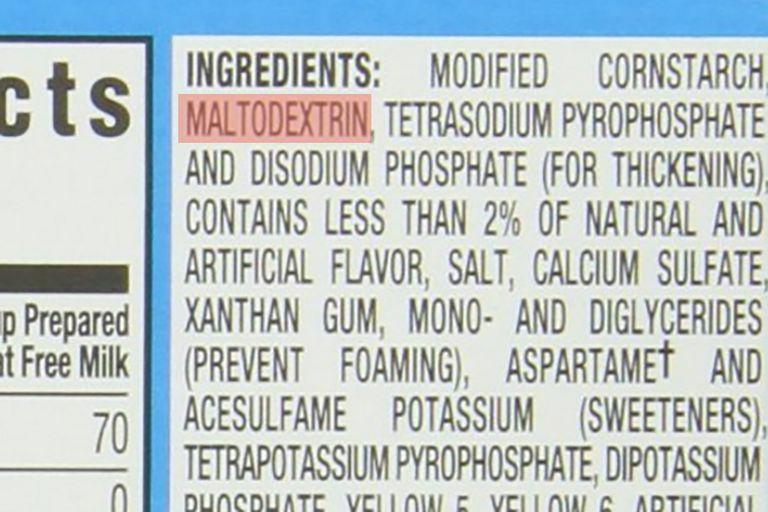 In the United States, maltodextrin is usually, but not always, made from rice, corn, or potato. In Europe, maltodextrin is frequently made from wheat. Dextrin can come from corn, potato, arrowroot, wheat, rice or tapioca. Where maltodextrin and dextrin come from, determines whether or not they are gluten-free. If maltodextrin and dextrin are made from wheat, as they sometimes are, then they might not be safe to consume as part of your gluten-free diet. However, since both dextrin and maltodextrin are highly processed ingredients, the amount of gluten remaining in them is likely to be small—possibly small enough for a product that includes one of them to still meet the legal definition of "gluten-free," which is defined as less than 20 parts per million of gluten). However, many people react to far less gluten than is legally allowed in foods. Therefore, you may want to avoid any food from a wheat-based ingredient, regardless of whether it meets that legal "gluten-free" definition. It's commonly believed that food manufacturers—at least in the United States—are required to call out any dextrin or maltodextrin made with wheat by stating "maltodextrin (wheat)" or "dextrin (wheat)" on the label. While that is true for food products regulated by the U.S. Food and Drug Administration, which includes most processed food products. It's not true for food products regulated by the U.S. Department of Agriculture (USDA), which includes meat, poultry, and egg products. Under the USDA's rules, a company can label wheat-based maltodextrin as plain old maltodextrin. This is an issue that comes up most often in hams, sausages, bacon, and other similarly processed meat products such as deli meats. If you are concerned a maltodextrin- or dextrin-containing product your bought contains gluten, contact the manufacturer and ask about the maltodextrin source. You can also stick with foods labeled "gluten-free" or "certified gluten-free"—as these companies are more likely to have done the necessary research before putting gluten-free labels on their products. You should also avoid any food product that looks risky, such as an obviously imported product with maltodextrin on the label, or where the manufacturer provides an answer that seems a little vague. In cases like this, it's better to play it safe than to be sorry. The Sugar Association, Inc. Labeling Terms fact sheet. GrokFood Online Food Additives Database: U.S. Code of Federal Regulations.